Copy editors sometimes help content developers find and retrieve information, and this editor's no exception. Someone recommended I try Research Solutions, and I did. I'm not a little bit happy with that decision. 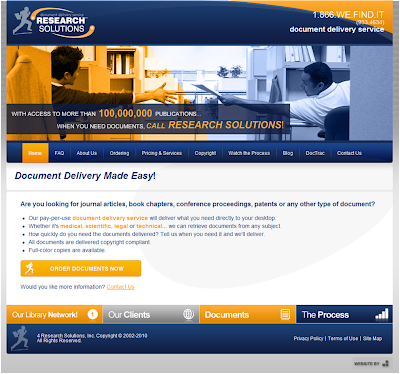 In fact, Research Solutions is now my go-to vendor for document delivery. RE: Welcome to Research Solutions! I wanted to tell you that the book chapter I ordered this afternoon just arrived a few minutes ago—remarkable speed, idiot simplicity, and reasonable cost make this transaction the best I've experienced in almost 10 years of editorial work. By comparison, I ordered the same material from Infotrieve only yesterday—still haven't heard from them, rang their offices and got stuck on hold, was eventually forced to leave a message, still unreturned. The editorial equivalent of root canal surgery, behold: Infotrieve.